It has been a while since I last posted a recipe, far too long! I have needed this time to enjoy my growing relationship with my partner and move into our first home together in Edinburgh. I have still been cooking wonderful fresh, organic, vegetarian and vegan meals and keeping up with my food photography. It has been wonderful sharing my food with my partner and also loved learning new recipes from him. He is also a vegetarian (awesome!). Buddha bowls, or veg and grain bowls are my favourite lunch at the moment. Quick and easy to make yet delicious, filling and a great way to have a balanced lunch, instead of the usual sandwich! They can be adapted and changed to have all of your favourite things in. They are also a great way to use up left over rice and vegetables. I like to make mine with a mix of fresh, raw fruit and vegetables, a grain and a plant based protein, such as chickpeas. 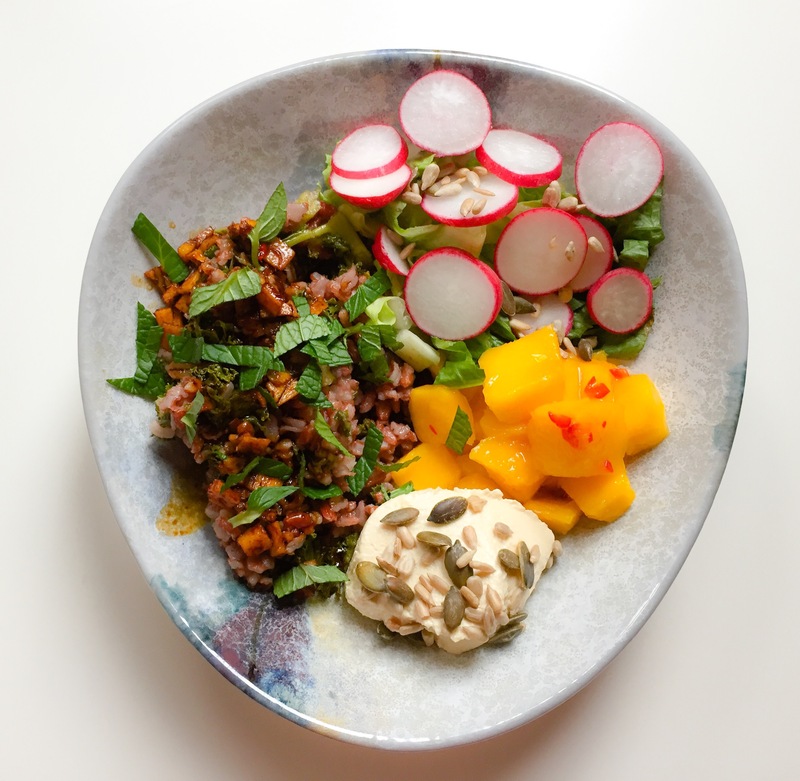 The one I am sharing today was a wonderful bowl which I used red rice with a soy, ginger and lime dressing, chilli and lime mango, salad leaves with radishes and humous topped with pumpkin seeds and sunflower seeds. Marinate the mango for 10 minutes in the juice of the lime and chilli. After 10 minutes, drain off the lime juice into a small cup. Add the soy, sesame and ginger then mix. Mix the rice with some kale. Place the rice in your favourite bowl, top with the soy dressing. Place the mango, hummus and salad in the bowl. Top with pumpkin and sunflower seeds and the fresh mint.